Hiding out during the night, they headed to Dodge City on stolen horses in the morning, registering at Deacon Cox’s Boarding House as Dr. and Mrs. J.H. Holliday. Doc so appreciated what Kate did for him, that he was determined to make her happy and gave up gambling, hanging up his doctor’s shingle once again. In return, Kate promised to give up the life of prostitution and stop hanging about the saloons. However, Kate couldn’t stand the quiet and boredom of respectable living. She told Doc that she was going back to the bright lights and excitement of the dance halls and gambling dens. Consequently, the two split up, as they were destined to do many times during the remainder of Doc’s life. 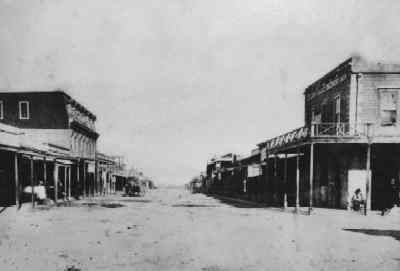 Dodge City’s Front Street, 1874, courtesy Ford County Historical Society. Doc went back to gambling, frequenting the Alhambra and dealing cards at the Long Branch Saloon. Though Dodge Citycitizens thought the friendship between Wyatt and Doc was strange, Wyatt ignored them and Doc kept to the law while in Dodge City. One night, while Doc was dealing Faro in the Long Branch Saloon a number of Texas cowboys arrived with a herd of cattle. After many weeks on the trail, the rowdy cowboys were ready to “let loose.” Leading the cowboy mob was a man named Ed Morrison, whom Wyatt had humiliated in Wichita, Kansas, and a man named Tobe Driskill. The cowboys rushed the town, galloping down Front Street with guns blazing, blowing out shop windows. Entering the Long Branch Saloon, they began harassing the customers. Later, Kate and Doc, in their constant love-hate relationship, had another of their frequent, violent quarrels. Furious, Doc saddled his horse and headed out, winding up in Trinidad,Colorado. Shortly after he arrived, he was goaded into a fight by a young gambler, known as “Kid Colton”. The “Kid”, either wishing to make himself a reputation, or very unaware of Doc’s gunmanship, wound up in the dusty street with two bullets. Not wanting to linger, Doc rode on to Las Vegas, New Mexico, where, in late summer of 1879, he hung out his shingle for the last time. However, this idea was short lived and only a few weeks later he bought a saloon. In late August, 1879 Doc got into an argument with a local gunman, named Mike Gordon. The two took the argument to the street where Doc politely invited Gordon to start shooting whenever he felt like it. Gordon obviously accepted this invitation and wound up dead with three shots in his belly. Again, a lynch mob formed with plans to lynch Holliday and Doc headed back to Dodge City. However, he arrived only to find that Wyatt had gone to a new silver strike, in a place called Tombstone, Arizona. Big Nose Kate was also nowhere to be seen in Dodge City. There being nothing to hold him there, Doc struck out West, bound for Tombstone. Allen Street in Tombstone, 1882. Unknown to Doc, “Big Nose” Kate was also enroute to the new boom town of Tombstone and the two ran into each other in Prescott, Arizona. Doc was winning heavily at the tables and pocketing $40,000 in winnings, Kate was happy to keep him company. In the early summer of 1880, the two reached Tombstone. When Doc arrived in Tombstone, not only did he find Wyatt, but all of theEarp brothers including Morgan from Montana, James who traveled with Wyatt from Dodge City, and Virgil from Prescott, where he had just been made a Deputy U.S. Marshal. Wyatt and his brothers were mining silver and James was dealing Faro at Vogan’s Saloon. Virgil appointed Wyatt as the acting City Marshal, and also swore in Morgan as an officer. When the Earps had arrived in Tombstone, the outlaw Clanton Gang had been running roughshod over the territory and immediately resented the Earps arrival. “Old man” Clanton, his sons, Ike, Phin, and Billy, the McLaury brothers, Frank and Tom, Curly Bill Brocius, John Ringo and their followers lost no time in expressing their displeasure. Holliday was a welcome addition to the Earp’s fight with the “Cowboy” faction. Shortly afterwards, Kate was running a boarding house in Globe, Arizona, some 175 miles away from Tombstone. However, she was known to often stay with Doc when she visited. In October, 1880, Doc had a dispute with a man by the name of Johnny Tyler in the Oriental Saloon. Though Tyler quickly high-tailed it out of the saloon, Doc and the saloon owner, Milt Joyce, continued to argue. As usual, the argument turned violent and Doc, who was drunk at the time, fired several shots hitting Joyce in the hand and his bartender, Parker, in the toe of his left foot. In retaliation, Milt struck Doc on the head with a pistol. Doc was arrested and charged with assault with a deadly weapon, found guilty and fined $20 for assault and battery plus $11.25 court costs. 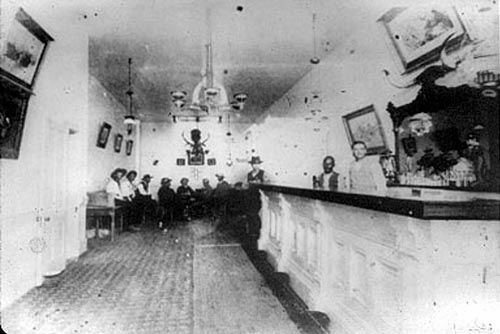 Many times when “Big Nose” Kate visited Holliday, they were known to have frequent arguments, most of which were not serious until Kate got drunk. Often, her drunkenness would escalate to abuse, and in early 1881, Doc had finally had enough and threw her out. On March 15, 1881, four masked men attempted a hold up on a stagecoach near Contention and in the attempt, killed the stage driver and a passenger. The Cowboy faction immediately seized upon the opportunity and accused Doc Holliday of being one of the holdup men. The sheriff who was investigating the hold-up, found Kate on one of her drunken binges, still berating Doc for throwing her out. Feeding her yet even more whiskey, the sheriff persuaded her to sign an affidavit that Doc had been one of the masked highwaymen and had killed the stage driver. While Kate was sobering up, the Earps were rounding up witnesses who could verify Doc’s whereabouts on the night in question. When Kate realized what she had done, she repudiated her statement and the charges were thrown out. But, for Doc, this was the “last straw” forKate, and giving her some money, he put her on a stage out of town. Throughout the summer of 1881, the threats against the Earp Brothers by the Clantons increased. The Cowboys, as they were referred to, were often heard telling bar room stories of how they were going to send Wyatt Earp to Boot Hill. Wednesday, October 26, 1881 was an overcast windy day. The Earps, in anticipation of trouble, woke early. As Virgil watched from his hotel window, he saw Billy Clanton ride into town, accompanied by friend Billy Claiborne. They met the McLaury brothers and Ike Clanton on Allen Street. Ike was looking for Holliday but before he could find him, Virgil and Morgan confronted him. Ike, bracing a shotgun, exchanged words with the two but when Clanton raised his rifle Virgil subdued him, impounded his rifle, and dragged him before Justice of the Peace Wallace, who fined Ike $27.50 for carrying firearms in the city. Wyatt and Tom McLaury, both hearing what had happened, met at the judge’s door at the same time, literally bumping into each other. Though Wyatt apologized,McLaury insulted him and, in return, Wyatt brought his gun down on McLaury’s head. 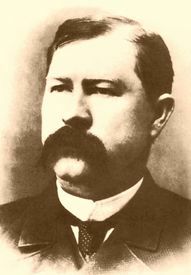 Then John Behan, the County Sheriff, appeared pronouncing, ” Ike Clanton and his crew are on Fremont Street talking gun-talk.” Evidently, Ike Clanton, the two McLaurys, Billy Clanton and Billy Claiborne were meeting in a vacant lot planning to bushwhack Doc Holliday, who passed that way every morning. However, the Cowboys were surprised when the Earps showed up and Doc was with them. As they made their way to the O.K. Corral, witnesses said that the three Earp brothers were all dressed in black with firm, mean grimaces on their faces while Doc was nattily clad in grey and was whistling. Where the two forces finally met was actually 90 yards down an alley from the O.K. Corral. The actual gunfight took place off Fremont Street between Fly’s Photo Gallery and Jersey’s Livery Stable. The Earps passed by the O.K. Corral, but cut through the alley where they found the troublemakers waiting at the other end. What happened next was a blur, occurring in about 30 seconds. 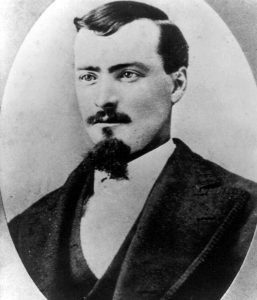 The shooting started when Billy Clanton and Frank McLaury cocked their pistols. It is not really known who fired the first shot, but Doc’s bullet was the first to hit home, tearing through Frank McLaury’s belly and sending McLaury’s own shot wild through Wyatt’s coattail. 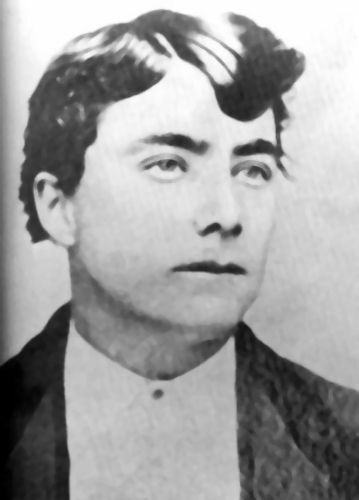 Billy Clanton fired at Virgil, but his shot also went astray when he was hit with Morgan’s shot through his rib cage. 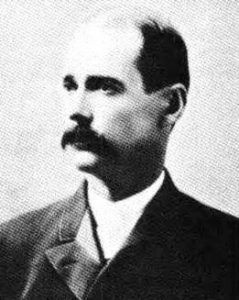 Billy Claiborne ran as soon as shots were fired and was already out of sight. Ike Clanton, too, panicked and threw his gun down, pleading for his life. “Fight or get out like Claiborne!” Wyatt yelled and watched Ike desert his brother Billy, as he ran towards the door of the photography shop. But, Ike then withdrew a hidden gun firing one more round towards Wyatt before disappearing. The sound distracted Morgan, enough so that Tom McLaury sent a bullet into Morgan’s side. Doc instantly countered, blowing Tom away with blasts from both barrels of his shotgun. Desperately, wounded and dying, Billy Clanton fired blindly into the gun smoke encircling him, striking Virgil’s leg. Wyatt responded by sending several rounds into Billy. 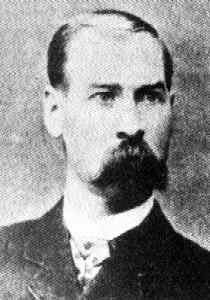 The 30-second shootout left Billy Clanton, Frank McLaury and Tom McLaury dead. 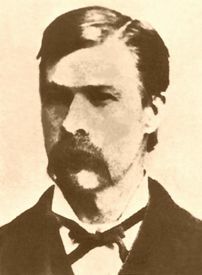 Virgil Earp took a shot to the leg and Morgan suffered a shoulder wound. As Wyatt stood, still stunned, Sheriff Behan appeared advising him he was under arrest. The Earps and Doc Holliday were tried for murder but it was determined that the Earps acted within the law.